Enstella Systems has made wonderful EML to MBOX Converter Software that effortlessly works to recover EML file and convert EML to MBOX file without losing any data. EML to MBOX Converter Software allows users add multiple EML file one by one and convert multiple EML files into MBOX file that will be open in different mail clients application which create MBOX file such as- Postbox, The Bat, Mac Mail, SeaMonkey, Entourage, Pocomail, Spicebird,Mail Copa, Earth Link, etc. Through EML to MBOX Converter Software helps users to extract EML file and also convert eml to mbox with maintains all data integrity. Convert EML file to MBOX file and also makes them accessible by using the wonderful EML to MBOX Conversion Software that supports all versions of EML files for Export EML to MBOX file. 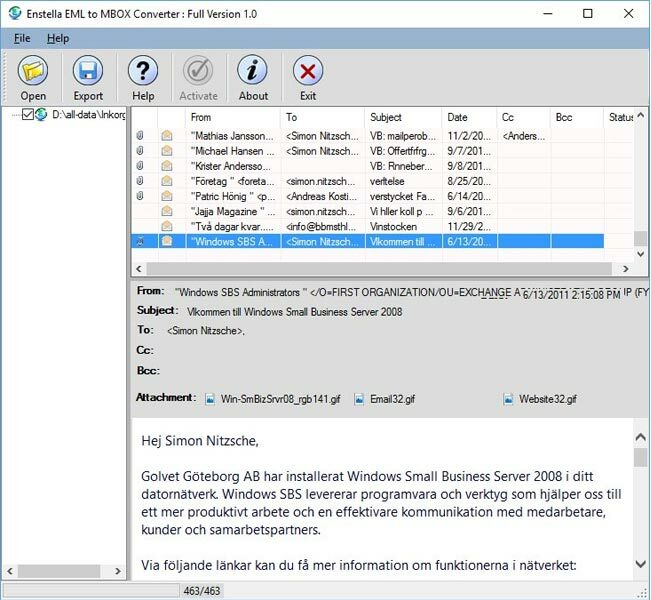 Software will support all EML file mail clients’ applications such as- outlook express, thunderbird, windows and windows live mail and convert EML file to MBOX file along with all data such as- emails, contacts, calendars, task, notes and appointments. There no size limitation of EML files for recovery and conversion into MBOX file. Download demo version of the software that allows users to restore 25 emails per folders into each format at free of cost but for restoring the complete data of EML file to MBOX file there you have to purchase full version of the software.